Why not wear a stylish and trendy jumpsuit for your next casual party or formal event? 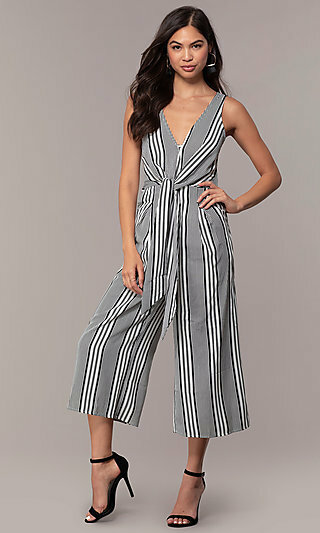 While a dress may be the norm for a special-occasion event, be bold and original in a jumpsuit that is not only beautiful and trendy, but also easy to wear. A fabulous one-piece outfit that is both chic and versatile, casual jumpsuits are perfect for a day of shopping with friends, while dressy jumpsuits for parties and formal events provide a super fun fashion twist. Shop this collection of formal jumpsuits and casual jumpsuits from Simply Dresses and make a style statement at your next event. Can I Wear a Jumpsuit to a Wedding? Yes, you can wear a jumpsuit to a wedding! 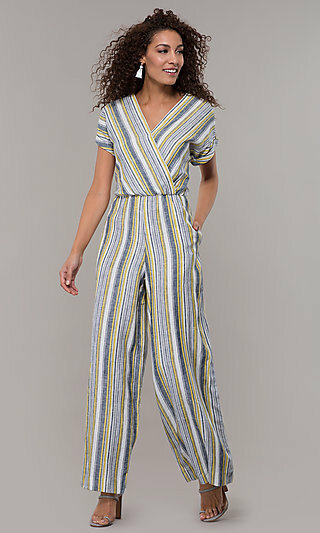 Jumpsuits are a fun and striking style choice for casual ceremonies, as well as black-tie weddings. Be a fashion-forward wedding guest when you arrive in a sassy floral-print jumpsuit at a semi-formal reception. Maybe a sleek v-neck formal jumpsuit with wide chiffon legs is more your style or an illusion-bodice dressy jumpsuit with a chic high neckline. 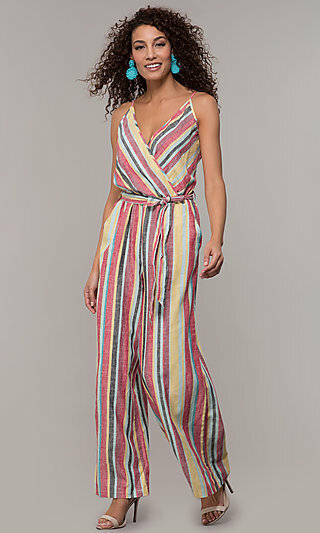 Even in warm weather or at a laid-back beach wedding, a casual jumpsuit in a light-weight fabric is sure to keep you comfortable and stylish. For a wedding in the colder months, you will be happy that chose a jumpsuit for parties, for it will keep your legs are cozy and warm. Whether the nuptial celebration is a casual, semi-formal, or formal event, a wedding-guest jumpsuit is an up-to-the-minute style that is as eye-catching as it is trendsetting. When it comes to any special occasion, you in your trendy jumpsuit will be the star of the show amid a sea of dresses. 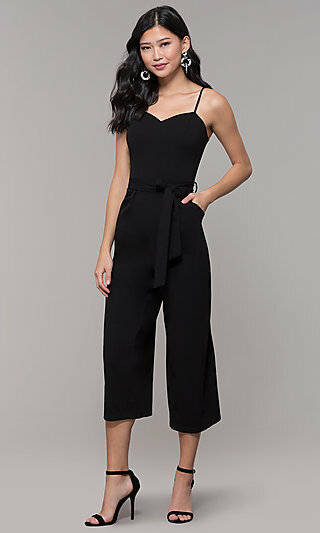 Imagine yourself in a black cold-shoulder party jumpsuit or a v-neck jumpsuit with three-quarter sleeves at your next cocktail party or date night. Planning to attend a formal party? Stand out in a long black tuxedo-style jumpsuit with belted waist or a ruffled one-shoulder wedding-guest jumpsuit. For special occasions that call for sparkle, there are metallic v-neck jumpsuits and strapless glitter jumpsuits for parties. Want to hang out with friends, but you’re bored with the same old jeans and t-shirt? Try a cropped floral-print jumpsuit or a striped casual jumpsuit for an eye-catching, yet relaxed look. For a fresh, new style trend, shop this collection of figure-flattering misses jumpsuits and stylish plus-sized jumpsuits at Simply Dresses.